So as I alluded to in my last post, my local gaming group has been discussing trying out a couple new game systems what with all the Kickstarters and whatnot we've gone in on. Sedition Wars, Zombicide, OGRE and more have all been looked over, discussed and played over the last few months. In addition, the fellow who organized the Tempus Fugitives Age of the Emperor events has been heavily involved in doing some video blogs for Tabletop Nation which got us interested in trying out the skirmish game MERCS. We'd ordered up a couple rulebooks and some starter sets from our FLGS but unfortunately the stockist they order from only has spotty inventory on the MERCS stuff. For now all that has arrived is the FCC faction box, but I figured that there was no reason not to get to painting! The FCC are a sort of violent protestor group that disagrees with the ways and methods of the MegaCorporations, and undertake missions to stop the evil/greedy MegaCons from doing whatever horrible injustice they happen to be up to at the moment. I'm envisioning my group as a sort of "Earth First on Steroids" team, which I've dubbed the Boulder People's Liberation Front or BPLF. (Not to be confused withe the People's Liberation front of Boulder - those splitters!) In homage to old Boulderite fashion I used a peace symbol as their unit demarcation. I'm thinking I ought to go back in and give a couple of them a little tie-dye or hippie flower here and there as well, for a little splash of color. One of the conceits of the game (apparently, as I have yet to get my hands on the proper printed rulebook) is that in general there are only ever 5 models per side, and it takes place on a 2'x3' playing area, so the scale of it is quite the change from the sprawling 6'x8' tables and dozens if not hundreds of miniatures common to our games of 40k. It was quite fun to bash out "an entire army" in an afternoon! I did want to stick a little closer to a 'realistic' color palette for these, khaki and olive drabs were the order of the day as the FCC are more of a revolutionary/militia unit. The more technologically advanced factions with their power armor and laser cannons may get some more unusual colors - for now though I'm pretty pleased with the overall look (though I do need to get some parchment paper diffusers over my lamps, the models really aren't this shiny!). First up is the leader, or Housemaster, of the FCC. Right out of the gate the difference in sculpting style became apparent - unlike the 'heroic-style' miniatures I'm used to painting, these minis have much more natural proportions. No giant heads and 6' rifles! When I first started putting them together they really looked disproportionate, but now that I've had time to come to terms with them, they actually do look far more natural and realistic! Next up is the Liaison model. The FCC are unusual in they can 'recruit' a handful of members from other factions to fight alongside them for a battle. When this is done, the Liaison allows the allied 'Black Ops' members to more fully utilize their abilities - it is mentioned that the Black Ops members are generally lower-ranking/less experienced faction members, and as such they do not get the full panoply of skills and abilities. Having a Liaison means that some (but not all) of the lost skills and abilities are made available. The Boomer is the 'heavy weapons' member of the FCC, and carries a grenade launcher which is apparently a rather nasty weapon in-game. Particularly fun is the opportunity for the Boomer to utilize any grenade type that happens to be carried by a Black Ops ally and optionally fire them instead of his usual Frag grenades! The Chem Engineer seems fairly unpleasant - he fires irradiated ammo which weakens targets, and can lob toxin grenades which slow and damage targets as well. Definitely seems like he's in a 'denial' role, though it remains to be seen how he works in the field. Last up is the Housemember, who is a fairly basic grunt. I don't see that he's much more than filler and will likely be the one left on the sidelines when choosing which 5 models will participate in a given scenario. Still, I quite like the model with its boonie hat, handlebar mustache and bionic eye. You may have noticed the white marks on the bases, that is for facing and flanking which apparently plays a big part in the rules. It's easier/more deadly to shoot someone in the flank or rear, so it's important to denote the fire arcs and such. To that end, I ended up adding a bit more to the base rims after I'd taken the first batch of pics, with a green and red dot denoting front and rear arcs and yellow to denote the flanks. I think it'll work out quite well - now if only the rest of the order would arrive so we could actually try out a game! That's sounds awesome - a skirmish based game.The minis look great. I will keep my eye on this as at some point i may want to get back into actually playing with my painted minis but I just can't give the time 40k requires these days. So many cool mini in that range. Good work as always. @Zab: That's partially what drew us in to mercs, seems like it's a much quicker game. The barrier to entry is comparatively small and the minis are rather cool. @Manus: Indeed! I'm not totally sold on the entire range but there are some gems! I'd ordered FCC and KemVar and a friend of mine is doing Texico and CCC so there should be a fair representation in pictures to follow! Mercs ia a great little game. Plays very fast too. Very glad you didn't get laid off dude. Nice mini's too. Very cool man.. I was just looking at that game and thought the models looked pretty cool. Nice work! @Col. Ackland: There's more to come, started working on the KemVar unit recently. Pics to follow! @Lead Legion: We got our first set of test games in over the weekend, seems rather interesting though we skipped all the advanced combat stuff which sort of hamstrung one of the teams. Looking forward to playing more though! 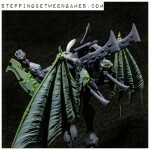 @Todd Sherman: They're definitely interesting to build and paint as their proportions are more 'realistic'. Took a little bit to warm up to them, but I have to say I quite like 'em!